Below are notes I kept throughout the month of September when I joined the world traveling group called Pangea196. 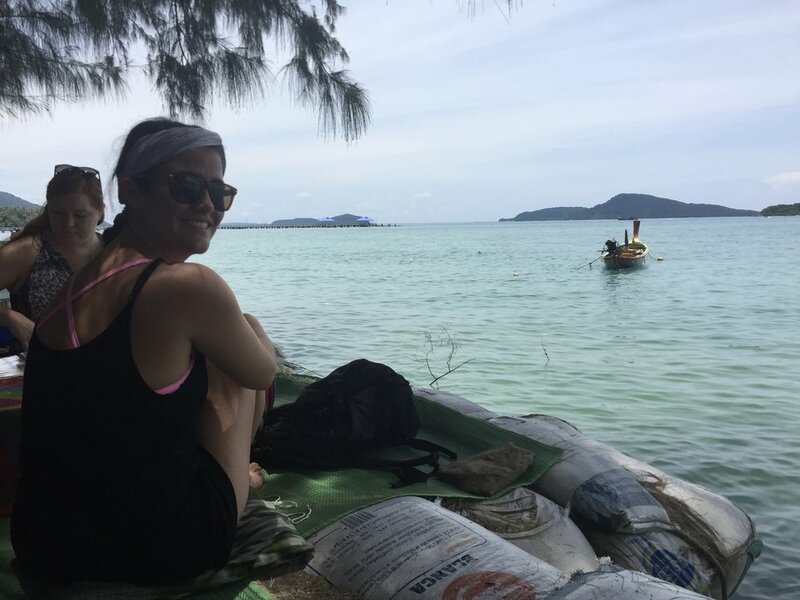 Pangea196 is a remote work program that allows individuals who have remote jobs to "slow" travel the world one month at a time while working and exploring. At the time I joined, there were nine of us in total. Each Pangean was open, kind, and instantly made me feel comfortable and welcome. If you are interested in learning more about this type of remote work traveling experience feel free to contact me. I have nothing but great things to say about my experience. I arrived around mid-day to Patong. I kept myself active and awake throughout the day. We took a sunset walk along the beach and found a posh place to sip coconut and mango shakes while watching the sun go down. After I visited the co-working space – Garage Society – where Pangeans can go to do their work 24/7. The Garage Society is a great place to co-work in Patong. There are many surfaces that you can work from, chairs you can sit in, rooms that are quieter than others, and of course, it was clean and fresh. Next I had my first experience at the grocery store. I love wandering around grocery stores (anywhere!) to see what is there. I found a few staples for home – apples, broccoli, chia seeds, almond milk, and coconut shreds – yeah! Serving size: up to you! In a bowl combine chia seeds, ground flax, apples, spices, and stir together. Slowly pour the milk over. Top with preferred toppings and enjoy! Around mid-morning, the nine of us hopped into a van and ventured to a different part of the island, Ra Wai Beach. We happened upon a waterfront café where we sat cross-legged on cushions while sipping mango shakes and eating green curries. Taking in the scenery and starting to know who my pals are and where they come from felt good. After we took a walk to The Coffee Tribe where there was a “digital nomad” (dm) meet-up. Before arriving at our meet-up we stopped into a hole in the wall for a sip and a bit of a jig. S got down and we had someone playing a tambourine from behind the bar. At the dm meeting, we met many new faces who have an array of different jobs- a d.j.’ing Aussie, a soon-to-open yoni egg business owner, and a personal trainer who trains people on the beach immediately before a beach clean up. We enjoyed the meet up. Today we took a group cooking class at a local restaurant/cooking school, Pum, in Patong. Each of us had our own burner, ingredients, and prepared a different thai dish. I made the famous Tom Kah coconut soup. At the end we sat down together and were able to sample every dish that was made. We had many laughs. After we ventured to Banga walking street where we took a seat in one of the many bars. It was my roomie’s birthday so we spent time with her. Upon sunset, we strolled to Patong Beach and watched the sun go down. Post-sunset, a few of us made a grocery stop where we loaded up on essentials. We tuktuk’ed home. Restful Sunday. I edited a couple upcoming podcast episodes and was even able to catch with a few friends in the am – I am grateful for my galpals! Dinner was delicious, filling, cheap (under $3.00!) and early with my roomie at the market. My first day working from a co-working space. The space we have a membership to is called the Garage Society. It is clean, full of light, and feels good to be at. I returned to the apartment sharing a taxi with B – another Pangean – and completed a workout from Jillian of Like A Girl Fitness. I was drenched and felt strong after. During the evening, I had a visitor – this little gecko/lizard named Lucky. T came over and helped set him free. My roomie and I took a taxi to Chalong to try aerial yoga at the Yoga Connection. Since I am bit spoiled and only know aerial with a friend from Pensacola, C, I was in for an experience. This aerial class was more acrobatic than I had ever experienced which is not bad – just different! Besides taking it a little easy with the inversions (if pre-menstrual or menstruating, better to avoid aerial yoga) and giving my fingers and hands a workout, I felt good throughout. We finished off the class with a homemade kombucha – YUM. I am an enthusiast for vegan/plant-based cafes. No matter where on the planet I am – I will seek out the cosiest little spaces and make a visit or two or three while in town. Currently the two cafés that are on top of my list in Phuket near to where I am based in Pataong are: Atsumi Raw Café and Pure Vegan Heaven. We tried Pure Vegan Heaven and that was precisely what it was! Splitting a Mexican bowl and Thai spring rolls, we left with our bellies full and bodies nourished. I even tried an immune Rx turmeric shot that would have made a few turn their nose up and it would have been H’s favorite! Quiet am and I was able to get some work done. I met the mom of another Pangean. They were going to explore. Around 12:30 the group gathered into a van and we drove to Kamala Beach. It was lovely! I took in much needed and appreciated vitamin D and I even got a massage on the beach. The sweet Thai lady was strong and worked my shoulders and back firmly. To say I was relaxed is an understatement – I LOVE massages and similar self-care practices. We ended up having Thai lunch at Green Mango. I ordered a veggie green curry. We returned home and worked into the night. Work day. In the early evening I ventured to the market and bought myself a watermelon shake – tasted hydrating and fresh. The day began with a heavy downpour. The road below us was completely flooded. We waited a bit for the weather to clear and then we explored the mall as a group. Once I returned home I went to a nearby massage salon and treated myself. We had a cosy morning and in the early afternoon I spent some time at the market picking up a few this and thats for family and friends. In the early evening the nine of us hopped into a van and drove to the Big Buddha in Chalong. Our trek up the mountain was high speed (our driver was fearless!) with winding roads and an epic incline. When we arrived to the top, it was so stormy we could hardly see the Big Buddha, As we climbed the stairs and entered the Big Buddha platform, it felt magical. The monks were chanting, bells were ringing, the wind was blowing, and it was raining. We took pictures, walked in through the Big Buddha, and walked the 365 degrees around. It was neat! Afterwards three of us returned to the Pure Vegan Heaven and the other Pangeans went to Phuket Town to visit the food market. We spent the afternoon at the Elephant Jungle Sanctuary Phuket and I cannot think of a better note to end my little Thai adventure on! We met at the their office in Patong and shortly after were transported to the Jungle Sanctuary. The drive was epic - sitting in the open-air pick up with a cover feeling the wind blowing in our faces, and sharing many laughs with B, J, L, C, and T. At the Sanctuary we prepared the elephant's food (bananas, watermelons, etc.) and some even hopped into the water to splash around with the gentle giants. The sanctuary prepared a yummy lunch for us and had a few photographers snapping pictures here and there.